This section of the music notation portion is dedicated to what I have called "performance notation." It is not really about music so much as it is about directions to the performer on how to perform it. Most of it is intuitive, even the symbols used rarely require much explanation. Consequently, this part will more resemble a dictionary than a tutorial. As I mentioned in the previous section, if all you want to do is read just enough music to finish these pages on music theory, you may safely skip this page entirely, and perhaps the next one as well (on alternate notations). But, really, this is pretty intuitive. Give it a look through; you probably won't find much here that will dramatically challenge you. The first bar type is found in every piece of printed music. It means the end of the piece; if it is a longer piece, it may indicate the end of a movement or large section. If you run into one in the middle of a piece, it means you will be at that place in a little while (presumably after a repeat of some variety). If the second vertical bar is not thicker, as illustrated in the next picture, it simply is dividing sections of the current piece, and generally has little effect on performance, except that it is likely to be the point at which one sees some instruction to jump to another location (e.g.,  [Dal Segno], to be discussed presently). The third one, you need to pay attention to, though. That means you need to repeat some section of the piece. If you saw the fourth bar version (repeat-from) a little earlier, that is the place to which you are supposed to return. If you didn't have one, you are supposed to go back to the start of the piece. Sometimes you will have the repeat-from bar there at the beginning, but don't count on it. The repeat and repeat-from signs can be combined as in the last illustration. Generally, a repeat is a one time thing. It isn't like a GOTO in a programming language that keeps you going over that same section over and over until something tells you to get to the next part. In fact, if you have a repeated sections, and then later get told to go back to the start (or elsewhere within the piece, but before the repeat), you ignore the repeat the next time you come to it, unless there are specific instructions to do otherwise (which you could have anyway, the composer may instruct you to repeat a section twice rather than once, but that will have to be stated explicitly). Come Thou Fount of Every Blessing from the Methodist Hymnal & detail of last measure. But if that repeat does come on the last measure, it is doing double duty, both as a repeat and as an end-of-piece marker. 1 On rare occasions, you may find two different segnos in a piece. In order to distinguish them, one of them will be doubled. Sometimes that is as simple as this: . But if the publisher's music typographer had too much time on his hands you may see this: . In either case, they have to tell you which one you are Dal Segnoing to, so you will see something like  D.S. to tell you to go back to the double segno. A related instruction is  (Da Capo = 'to the top') which, predictably, means, jump back to the beginning of the piece. Either one of these instructions may be associated with the instruction, 'al Fine' (to the end). When you get this it means that the end of the piece will not actually be at the end of the score. I will be indicated by the first variety of double bar above, and (probably) labeled 'Fine' (end). The first time you run into this, you ignore it, since there is obviously more music to play. When you come to the  or , you jump back to the indicated place and play up to the Fine, at which point you are done.  This is the coda symbol. The term (coda='tail' in Italian) also describes what in modern pop might be called an outro or a tag. Not surprisingly, then, the symbol often indicates where it starts. This would, in itself, be informative, but generally useless information, except as a place for your band/orchestra director to tell you to start from during rehearsal. However, in musical notation, it has another use, which may have little to do with outros. 2 As with segno, the composer might need multiple codas. Fortunately, typographers have not gotten to this one yet, so a double-coda is a simple . Just as with the segno, the score will have to tell you which one is intended with something like  al . Those are the jumping around instructions that are common enough to require Italian names and special symbols. The composer, of course, is not limited to these instructions, and some of those other things are quite common (like singing a refrain, for which there is no official Italian musical term-which is not to imply that Italian songs don't have them). If the composer wants you to do something else, she just has to write the instructions into the piece (hopefully in a language that you understand). Some things (like the repetition of hymn verses) are just expected parts of the genre, which you are expected to know. 3 Of course, we know that the instrument we call a piano is not always quiet. We have shortened the name from its original form which was, 'piano-forte.' It was named this because, unlike its predecessors, the clavier and the harpsichord, it could be played either softly or loudly. Getting louder more slowly is called a crescendo; getting softer is a diminuendo (or decrescendo). These are indicated by elongated arrows:  or , except generally much longer (alternatively, the instructions can be simply written, particularly if they cover an even longer period, and are usually abbreviated as cresc./dim.). If the arrows are used, the idea is that their length determines the amount of time covered by the process. A crescendo arrow that takes up the space of three measures is expected to take three measures in time to complete. Often there will be dynamics marker (, , etc.) at the right end to tell you what the target volume should be. This will certainly be true if the instruction has been given by writing cresc. or dim. If you see , that is sforzando ('forcing'), it means you should play suddenly louder (relative to whatever your current dynamics were), but then just a quickly back to your baseline.  works almost the same way. 4 Of course, some words have been re-appropriated by other, often commercial, interests. Last night I had some "Allegro" coffee. Ironically, it was decaffeinated.  (ritardando) Sometimes you have been playing at a certain tempo and the composer wants you to slow down for effect, frequently right at the end. This is how she tells you. a tempo OK, enough with the tempo change, back to regular speed (whatever that was).  (fermata) You really are done. Hold this note (chord) until it fades out, or until the conductor tells you to stop. If you are singing, this will usually be right after you pass out. Here are a bunch of others that don't fit so nicely into the above categories. 5 If you see two numbers under some notes in a single piano bass line, that is figured bass, not fingerings. That will be discussed later. 6 When I was in college, one of my professors encouraged us to distinguish between slurs and ties, making the ties look more like sideways brackets. Then in another class, the professor complained that I was doing what the first prof. had told us to do. If you use Finale® score software, you will see a distinction in color on the screen (slurs are red), but when you print, that distinction is lost. For the reason I gave in the text, performers are unlikely to confuse them, although if you are slurring a passage with tied notes in it, you should still mark the ties. ,  Down/up strokes. They are supposed to look like the frog and tip of the violin bow, respectively. They indicate whether the note should be played with a down stroke (stronger) or an up stroke. On guitar and other plectrumed instruments, they mean whether the strum/pluck is down () or up (). The strength/weakness effect is generally similar. These may be editorial marks, but sometimes they do come from the composer, since they directly affect the sound.   Arpeggio marks come right in front of a chord. They mean that the chord is rolled (notes played quickly in succession, but as one chord sound. On guitar, this means strumming slowly. On violin, it means rolling the bow across the strings. On piano, it is like your fingers are rolling up the chord. Etc. Note that the second one has a small down arrow. Most arpeggios go up, but if there is down arrow like that it means to arpeggiate top to bottom.   Glissandos look a lot like arpeggios that have lost their balance, but they sound very different. It means you are supposed to slide from one note to the other (the first one is up; the second is down). On a string instrument this is straight-forward. On a keyboard you have to run your finger up the keyboard to simulate a slide. Other instruments can pull it off with varying degrees of success (trombone: easy; water glasses: not so much [well, you could try a straw]).  or  or both In a trill, the indicated note is actually played as a quick successive alternation of itself and the next note up in the current scale, although sometimes the next note down. The Wikipedia article has some examples.   Turn and inverted turn (gruppetto). Where 0 = the starting note, 1 = a scale step up, and -1 a scale step down, If the turn appears directly over the note it means the sequence 1, 0, -1, 0. If it comes immediately after the note the same sequence is preceded by the 0. The inverted turn, logically enough, inverts that.  Staccato. The little dot directly under or over the note-head, indicates that it is to be played as a single short tone, but it is still assigned the same time frame. So this quarter note with a staccato mark would be played as a sixteenth note followed by a three sixteenth (dotted eighth) rest.  Tenuto. The is either an accent of sorts to ensure that you play the whole note, or an indication of brief separation between notes. It is never as short as a staccato.  Accent. I hardly need to explain this. What exactly an accent is may depend on the style of music. Usually it involves a slight swell in volume for the duration of that note. It may just be a stronger attack, or some other method of playing that makes that note stand out. In this fragment, the slur is the part with the sideways parenthesis over it. What is the difference between a slur and a tie? Whether the notes being connected are the same—try slurring two of the same note and see what you get.6 A slur is the opposite of staccato; it runs the notes together. How this is expressed depends on the instrument. With breath-controlled instruments like the trumpet or clarinet, this usually means playing with a continuous breath, and without allowing your tongue to interrupt the flow of sound even briefly. On plucked and fretted instruments it generally refers to not replucking the string-using hammer-ons and pull-offs. On bowed instruments it is a single continuous bow motion. 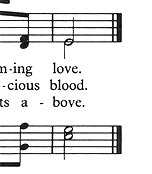 In vocal scores with lyrics, it is usually used to connect notes that are sung as part of the same syllable in the text (melisma). Some instruments, like the piano, don't really have a different way of producing slurs, in which case it is usually the same as legato, and functions mostly as an indication of phrasing, with no separation between the notes. <="" td="" width="100px"> Legato is pretty much the rest of the time: No clear separation between notes, but usually with independent attacks (tongue, breath, plucking, syllabification, etc.). Like any language, music notation is a constantly moving target. It expands to include new approaches to both playing and composition. New notational ideas, however, often take some time to catch on-to have some recognized acceptance. At the same time, archaic aspects of the language slowly fall out of use until only a few people remember what they mean. 7 'Outro' as the new name for 'coda,' for example. This is not to say that there are not some differences, only that they are not as radical as modern performers often assume. There are also parallel competing notation methods with long histories, and some of them have a life of their own. On the next page in this series we will look at some of these competing notation approaches. In some cases this is just historical curiosity, but in others I can guarantee that you will run into them.